Andrew Laughton opens the gates to his immaculate Beef Finishing Unit for NBA open farm walk and meeting. The NBA have announced that they will be visiting Southfield Farm, Andrew Laughton’s impressive finishing unit in Louth on Wednesday the 20th September as part of their roadshow of farm tours which will be held up and down the country with mainline sponsor AB Vista . Andrew Laughton will be opening the gates to his remarkable beef unit giving visitors the opportunity to view one of the largest beef finishing units in the country. His system is simple, utilising economies of scale and technology to produce a profitable business. Heifers and steers of varying breeds are bought in as strong stores from livestock markets or direct from farm and fed on maize silage blended with coproducts into a balanced ration for 3-6 months. All cattle are housed in large outdoor corals bedded out in straw which helps to illuminate issues with pneumonia that are common in housed cattle. The farm has grown from strength to strength since it was bought in the 1960s by Andrew’s father. The cattle finishing unit was created 20 years ago and now holds approximately 2400 cattle at any one time. 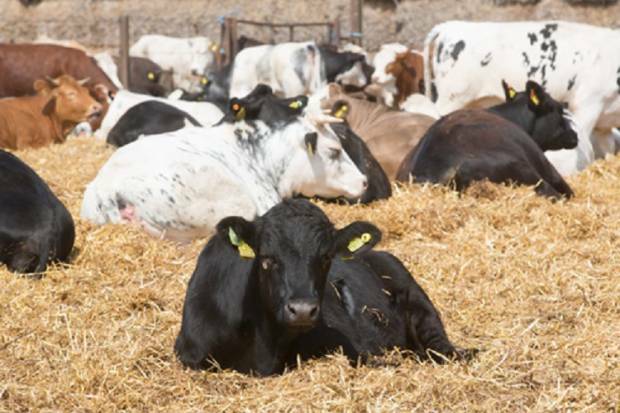 The unit was recently selected as a case study farm in AHDB’s Breed KPI project. All cattle are EID tagged and weighed regularly to track animal performance and link individuals back to where they were sourced from as well as health treatments and carcass value. The evening meeting will commence at 6.30pm. Following the tour there will be a presentation on “Optimising rumen function for improved meat eating quality” by Dr. Jamie-Leigh Douglas, Technical Support Manager for AB Vista, an update from the NBA and AHDB followed by refreshments. Attendance is BY BOOKING ONLY to allow us to confirm catering requirements. To Book your FREE place email [email protected] or call Head Office on 01434 601005.